Tues - Fri 10-6, Sat 9-4. Closed Sun & Mon. Save time - call ahead ordering available! Call us to place an order, pay over the phone, and pick up in store. 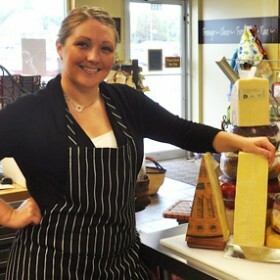 After successful seasons at local farmer’s markets, Natalie Fuller and her father, Terry St. Louis, opened The Cheese Lady on March 17, 2011. The location in the heart of Kalamazoo’s Texas Corners has provided the perfect setting for a unique cheese experience. Offering over 100 cheeses from around the world, we encourage you to sample, and learn about each and every cheese we carry. From the very young, to the very mature, our cheeses and customers are our pride! With a passion for cheese, and a commitment to superior customer service, we provide a venue for you to taste, discover, learn, and purchase. Our friendly and knowledgeable staff of cheesemongers is here to propel your cheese experience to the next level. Planning a party? Giving a gift? Need a night out? The Cheese Lady offers help for all! We custom build cheese trays and gift baskets to order. Further your cheese education with one of our classes or events, from Cheese 101 to Grilled Cheese Night, to wine and cheese pairings. There is always something new to explore! Come and learn with us! Signup for The Cheese Lady of Kalamazoo's newsletter. "Returning to this year's Bake Off we have 2 of our neighbors and partner businesses... Pink Lemonade GR Children.Home.Her - you must stop in here if y..."
Use the form to send The Cheese Lady of Kalamazoo a message.